We got a variety of terrain, and I chose to go second so I could observe his approach. Neither of us knew our Warlocks since we were both playing them for the first time, but my opponent was the local PG and as such knows the game much better. He went first. He ran up, parked the Earthborne in some woods, and everything else was on the other side of an obstructing rock. I shifted one of the Stones up, inverting the triangle, and moved up the Stone Keeper UA to the center of the triangle and cast stone form. I walked the Warden and Guardian up, popped the forest around the Warden. Moved Baldur up and fired off all three upkeeps, putting Stone Skin on the Stones+UA. He had screened Borka with the Kriels, so he ran them up to my leftmost Shifting Stone. The Axer charged the Stone Keeper, but only managed to do 4 out of 5 points of damage, thanks to Stone Form and Stone Skin. 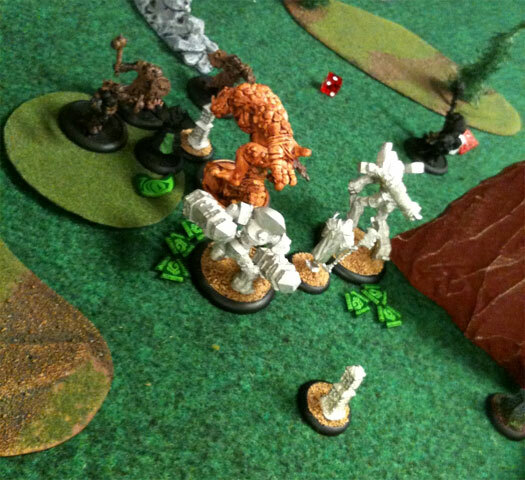 The Earthborne tried to charge the Guardian but ran into the Kriels and stopped short. Borka moved up and tossed a grenade but it deviated into the barrier. The guardian rammed the axer three times, knocking him away on the last hit. The Warden Geomancied Earth Spikes on the Kriels, killing the target but missing his three adjoining buddies. I decided I couldn’t charge through the gap between Axer and Obstruction to the Earthborne so I stepped the Warden up to the Axer, where I discovered I could have easily fit through the gap. I put the final smack on the Axer and my opponent reaved. Then I dropped a forest template near the Shifting Stone and Baldur Forest Walked, keeping the shifting stone between himself and the Earthborne. Then I did the first really dumb thing. I killed the nearest Kriel Warrior, who made his Tough roll, and I bought a second attack and pasted the other Kriel warrior in Reach. Who was blocking a charge lane. Next turn he stepped in a second Kriel Warrior and took a good swing at Baldur. I made mistake two: I spent my one remaining fury to transfer 6 damage to the Gaurdian (hooray, Empathic Transference). Next the Earthborne charged the Shifting Stone, removing it from the table. Then the Earthborne one-shotted Baldur. I should have left the Kriel Warrior in place, I thought the Earthborne couldn’t make it to Baldur through the feat, and removing the Warrior made it all the easier. We set Baldur to 1 health point and played it out until a fully loaded Borka chewed through the Warden and pasted Baldur with a big ‘ol mace, one turn later. I had a blast, many thanks to my opponent. I should have put Stone Skin on Baldur once he was in harm’s way, but also should have been more aware of the charge lanes and range of the Earthborne, even under my Feat. Also, Borka is a bruiser, and Earthbornes are tough with a lower case t.